Chart Your Own Course by Selecting the Colors of Your Custom Bracelet! Ideal for sailors and outdoor enthusiasts alike, sailing knot bracelets are a sign of trust and tradition. These yacht line bracelets embody the spirit of the sea and make perfect gifts for sailors, surfers, swimmers and anyone who lives near the sea or enjoys the water. 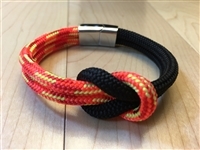 From black to camouflage and beyond, we’ve got a wide variety of quality and affordable square knot bracelets for you to enjoy. Like all our products, the bracelets in our Mariner Collection were handcrafted with care from high-quality materials and made in the USA. Designed with real marine yachting line and custom, magnetic stainless steel clasps, our Mariner Collection offers coastal comfort and proven durability. Browse our complete selection of classic and stylish square knot bracelets now to find the perfect gift for friends, family, and even just for yourself! Make it unforgettable! Customize your Commodore bracelet by selecting two of the following colors: midnight black, port red, starboard green, ocean blue. Let us know in the Comments section at Checkout with this code “My Custom Commodore Bracelet: 2 colors are…”. And remember: all orders receive free shipping!